A new school year and a new batch of Chinese students hoping to study at a US university. It’s a new school year, and as I mentioned I have a new job in Beijing, running the International Division—a partnership between Peking University High School and the Hotchkiss School in Connecticut. My management team has moved up with me to Beijing from Shenzhen; we’ve recruited thirty bright motivated students for our inaugural year, we have an excellent staff of both Chinese and foreign teachers, and even before classes started we’ve received favourable media coverage. But I admit I still deeply miss my students at Shenzhen High School, and regret how the Special Curriculum ended. Was I right to have stuck to my vision? I kept on repeating the message ‘it doesn’t matter what American university you get into, but how you do when you get there.’ Looking back, I realized how stupid and naïve Chinese administrators, parents, and students must have thought I was. In my first meeting with the new students in the new programme, I was intent on sticking to this message, but was unsure of how to best articulate it. Half an hour before orientation I received an e-mail from Zhou Yeran, a Shenzhen Middle School student who just started at the University of Illinois. I’ve written about him previously, and this past summer he began editing a feature hour-long documentary on the building of the Special Curriculum, 10 minutes of which you can watch here. I shared both Zhou Yeran’s video and e-mail with my new students, telling them that three years from now, when they are enrolled in US universities, I hope to receive a similar e-mail from all of them. In fact, it’s the goal and purpose of the International Division to educate them in such a manner so that every student will write me such an e-mail. ‘Having been in America for two weeks, I'm starting to understand why so many Chinese students are failing here. 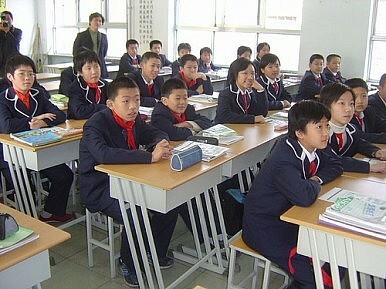 'The biggest obstacle for Chinese students is not culture, knowledge or even language. It's their narrow comfort zones that's making them isolated and socially marginalized. A Chinese student might speak perfect English and get straight A's in classes, but the idea of making friends using English, learning a new way of living or asking a question in class is simply horrifying for him. It is so tempting for him to stick with his fellow Chinese friends, speak Chinese all the time, and take totally unchallenging courses such as Math and Physics. In short, he wants to live his old life in this new country. But the thing about America is, living that old life is easy to do. People are used to gangs of Chinese shouting mandarin, and simply choose to ignore them most of the time. No one is eager to Americanize him, he either actively blend in or become isolated. Most Chinese take the latter, easier choice. 'Now I realize how important my last year in Special Curriculum is.The most crucial thing I've learned from this experience is not leadership or writing skills, but rather the spirit of constantly challenging myself, stepping out of my comfort zone and embracing new ideas. My new life here is a tabula rasa, I can do whatever I want to do and be whoever I want to be. I'm in the Yoga club (and totally enjoyed its first session); I'm learning Ultimate Frisbee; I'm taking the American Literature seminar (in which I am probably the only international student) and facilitating the discussions all the time; I'm socializing with all kinds of people: Americans, Indians, Koreans, African-Americans…; I've applied to work for the Daily Illini (I hope they'll hire me, because I really, REALLY want that job); I can be "Joe", "Zhou", or "Yeran". Although Unhappy With US Sanctions on Iran, China Won’t Fall Out With WashingtonChina Digs Deep in Landlocked LaosGotta Serve Somebody? Not Necessarily: Europe in the US-China CrossfireAlibaba’s Jack Ma Sparks Debate Over China’s Long Working HoursWhat Are China’s Plans for its Airborne Corps?